New cathouse on the block? 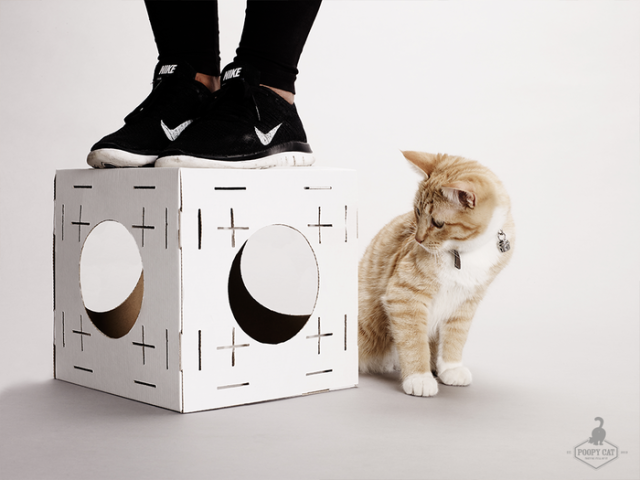 It's more likely than you think but don't fret for your property values, BLOCKS by Poopy Cat are lightweight, reusable cardboard construction elements that combine in infinite ways to your heart's (and your cat's) content. Recently overfunded by over 500% at Kickstarter, BLOCKS has already struck a chord with cat-owners looking to add a little spice to their mutual lives. Indeed, humans will have as much fun building and re-building indoor cat habitats as cats will have using, exploring and sleeping in them! The basic BLOCKS package consists of two beams, two cubes, a tunnel, a bridge, a slide, and two types of connectors. 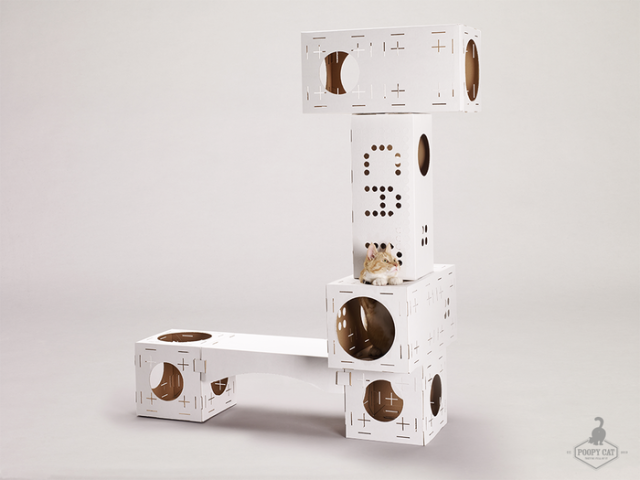 The more packages you add, the more possibilities for unique and interesting cat play complexes emerge. The only limit is your imagination (and presumably, your budget). The components have been extensively tested on a variety of cats displaying a wide range of temperaments. They're made from sustainable & recyclable materials, are 100% biodegradable, completely cat- and child-safe, and their white exteriors lend themselves to being painted. Now that the Kickstarter campaign has been deemed a roaring success, product deliveries should be commencing shortly. Besides contributing to indoor cats' quality of life with products like BLOCKS, Poopy Cat works with animal protective agencies and animal shelters by organizing events while making donations in conjunction with every product sold. All in all, BLOCKS by Poopy Cat would seem to be the cat's meow! This is One Hygienic Cat! The Clean Animal Video of the Day!! !